This easy fruit cake is ideal for almost any season. With fresh apricots and berries cropping up in the markets I decided to highlight them in this particular version. Rhubarb, apples, pears or plums also work well and can be substituted. For an extra treat make a brown sugar streusel to sprinkle on top. Preheat oven to 350ºF. Butter and flour 9-inch cake pan if it is non-stick. If it is not non-stick line the bottom of the pan with parchment paper. 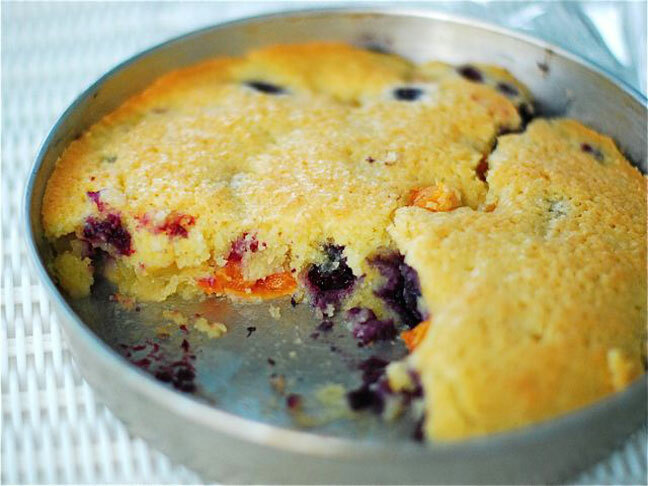 Scatter fruit evenly on the bottom of the pan and set aside. Mix first five ingredients in a large bowl until fully combined. Pour batter over fruit in the cake pan and sprinkle top lightly with sugar, this will make a nice crust. Bake for 40-45 minutes or until cake tester comes out clean.